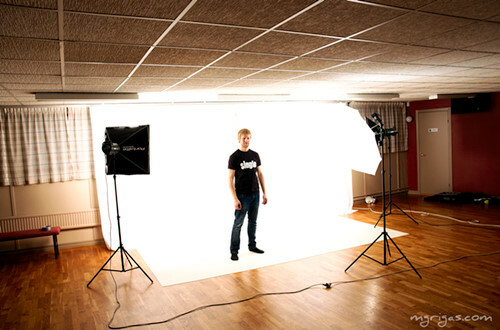 One of not-so-usual jobs from last year- photo shoot for GED, a dance studio in Göteborg. Talent was their top-rated couple Dawid and Frida- Swedish champions on multiple occasions etc etc. These two can seriously dance! I had a chance to observe them training and it was hard to keep up with all the moves, not to mention that inner feeling of being a tree stump or a rock or whatever heavy bulky and lifeless thing when it comes to dancing. Definitely worth going to see some dance competition when one comes to your town! And if it is Göteborg, you might even see photos made by me on GED's posters. That was the main intended use for the photos, thus all was shot on white seamless background. All prep work and reading up theory for shooting on white seamless came from Zack Arias. Now I am sure that what ever he says is true. Pay attention to all detail in his posts as those will pop up here or there. By the way- no stands were used to hold the background. All of it is held by duct tape :) Kinda lame, but it worked really well! As background was overexposed by a couple of stops no wrinkles were visible in the end. The flat linoleum kept the floor flat and wrinkle free. Biggest concern was the lack of space between subject and background. With only 2 meters at my disposal it was hard to avoid light spill from both the softboxes and the background. The two Elinchrom BX 500 Ri studio lights with kit softboxes had enough power to pull this off. Using a small SB-800 (triggered with Elinchrom remote) as the main light was not an optimal solution. I had to wait for it to reload too often too long. The setup worked out in the end. Still, going all by the book would have made life much easier. So, once again, read what ZA has to say about shooting on white seamless and make use of all the tips he is giving. This definitely was a different type of job compared to my usual children photography. But it was great. I still remember how happily tired I was that Saturday. And I met a great dance couple, plus gained a ton of respect to what they do! Thanks to Jochen for inviting me to do the shoot!